It takes a lot of keyboarding to make this site happen. And, no, the buttons don't work, yet. 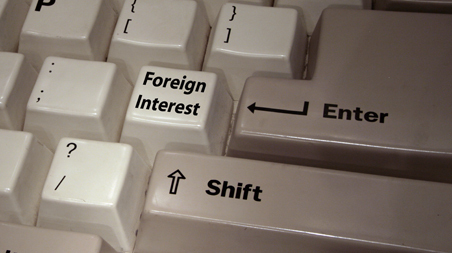 Foreign Interest is an online news magazine with a global perspective, for it is in our interest to understand the world. The story has been and always will be the center of journalism, not the monetization, the corporations, grass roots, academics or audience. Those elements are all important, but any or all without the story is not journalism. It really is about the story. The cavemen gossiped as much as people today about their neighbors and what the local leaders were up to in their daily lives. Their tools were rocks used to carve on cave walls. Fortunately, the printing press, radio, television, computers and the internet have revolutionized journalism's reach beyond those walls. The tools are important in shaping the means to get the story out, but again, it is the story that remains the center of journalism. In today's realignment, all the tools are important and should be cherished, for they all matter. © 2009 Foreign Interest. All rights reserved.